Experience true Southern Hospitality and grace in this impressive Victorian- Italianate residence built circa 1868 and the charming adjacent 1881 Guest House with its fifty-five foot long gallery, which overlooks the sparkling swimming pool, the river valley below and the Louisiana delta across the Mississippi river. The mansion was built by John Alexander Klein, on his Cedar Grove Estate for his son Madison Conrad Klein. The area which encompasses five of Vicksburgs most important houses, including Annabelle is know as the Historic Garden District. The Inn's 7 elegant rooms and beautifully furnished living areas provide the perfect setting for a romantic celebration or a tranquil retreat from everyday life. When you choose a magnificent honeymoon suite or another inviting room, your experience will be memorable! 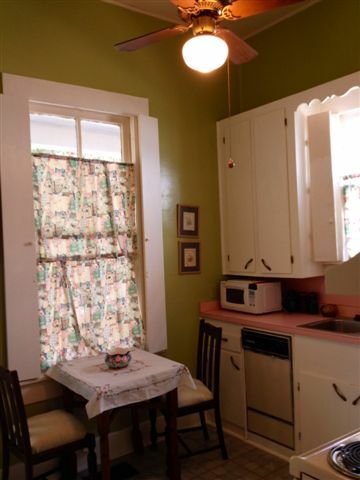 Each room in both houses evokes the flavor and opulence of the Victorian age, a slower, more genteel time. Annabelle invites you to experience Vicksburg as it was in an earlier, more elegant era. Some rooms offer fireplaces and relaxing whirlpool baths. All rooms have comfortable beds dressed in fine linens, 13 foot ceilings adorned with beautiful chandeliers, private baths with spa inspired amenities, soft fluffy robes, phones, cable television and wireless internet connections. is perfect for intimate conversation, a courtyard breakfast or sumptuous afternoon respite. All rates are based on double occupancy. Extra persons in room (roll away bed) $25.00 each. 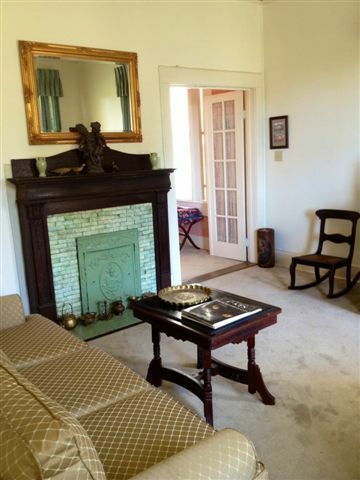 Elegantly yet comfortably furnished parlor featuring a queen sized hide a bed sofa , art, fireplace and antiques. Pass through the French doors into the bedroom furnished with a queen size bed dressed in luxurious linens topped with a brocade comforter. Kitchen ( extra charge) is complete with stove, refrigerator/ ice maker. Microwave and coffee maker. 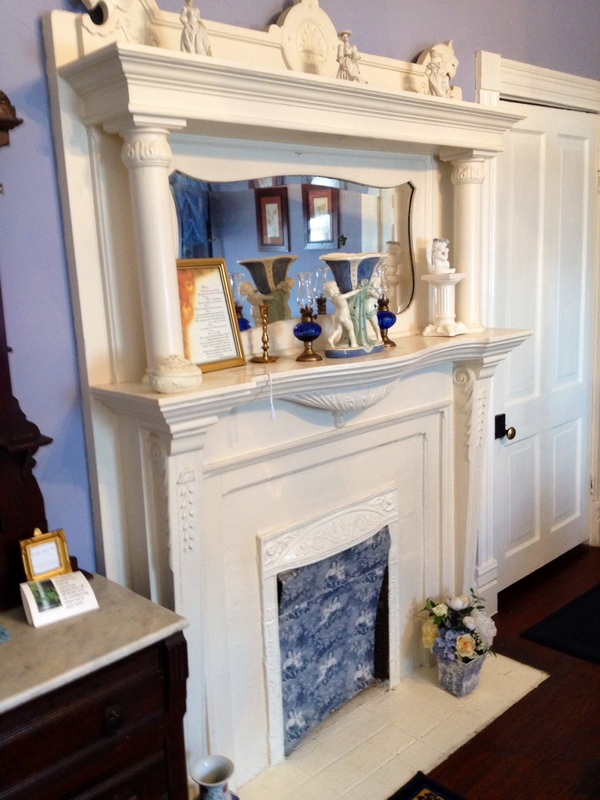 The wonderful retreat can be accessed from rear gallery or private front entrance. 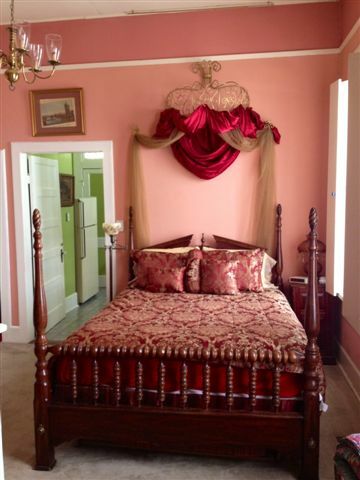 This suite can also be connected to the Wisteria room to create a two bedroom two bath suite. Private bath with tub / shower combination featuring exquisite hand crochet edged towels, soft fluffy bathrobes and spa inspired amenities. ($25 per person over two guest). We require notification of any change in reservation or cancellation 7 days prior to arrival. A 50% non-refundable deposit is required for long term reservations and for multiple room reservations. Check out our Dream Escape for Two.